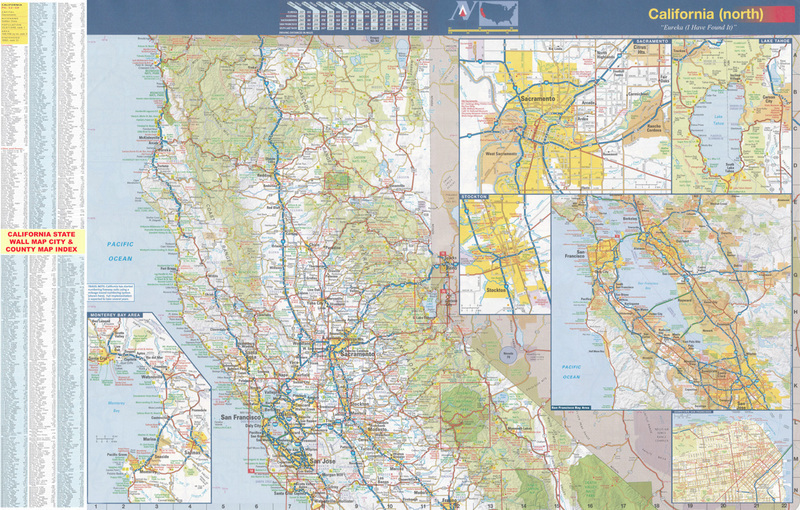 The California Northern Wall Map Executive Commercial Edition fit your business or home needs for a large wall hanging map reference for Northern California. Available in multiple sizes in paper, laminated or framed. 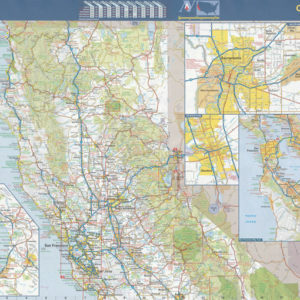 The California Northern Wall Map Executive Commercial Edition covers approximately 40 counties and uses up to date cartography, is printed in color, laminated, indexed on the map’s face for cities/counties, and shows color coded counties. Coverage ranges north to the state line; south to include San Jose; east to the Nevada state line including Reno; and west to the Pacific Ocean. Details all state highways, state universities, cities, towns, points of interest, longitude/latitude lines, all federal highways, military installations, state/national parks, mileage charts, county names/boundaries, major waterways, major airports, wildlife areas, and mileage circles. Available in a variety of sizes to meet your mapping needs.